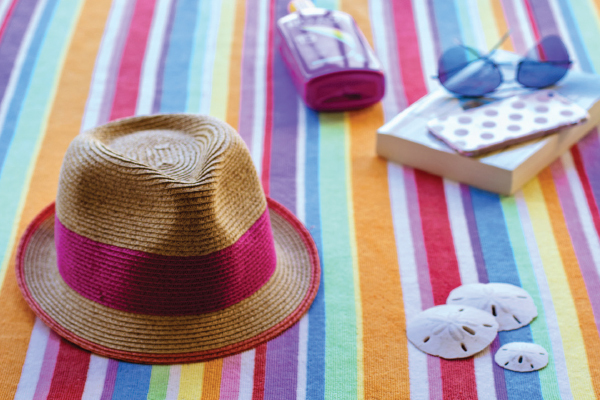 The next time you pack your bag for the beach, there are two items that are just as important as a bottle of sunblock: a hat and sunglasses. Ultraviolet rays, classified as UVA and UVB, not only wrinkle the skin, but can damage the eye’s surface tissues, as well as the cornea and lens. The sun can accelerate the formation of cataracts, pterygium (a non-cancerous growth over the cornea), skin cancer of the eyelids, and even result in an early form of age-related macular degeneration. Sunlight reflected off sand and water can cause photokeratitis, which is responsible for snow blindness. Sunglasses and broad-brimmed hats can dramatically reduce sun-related eye damage. However, don’t choose just any pair of sunglasses. According to a national Sun Safety Survey conducted by the American Academy of Ophthalmology, only about half of people who wear sunglasses say they check the UV rating before buying. Look for sunglasses that are affiliated with the American National Standards Institute (ANSI), which creates uniform testing standards and guidelines for a variety of products. Choose wraparound styles so that the sun’s rays can’t enter from the side. According to the World Health Organization, nearly 80 percent of a person’s lifetime UVR exposure is received before the age of 18. Children are far more likely to spend time playing outside, particularly during the warmer months. Children’s eyes are more vulnerable to UV rays because the lens of a child allows 70% more UV rays to reach the retina than in an adult. This may put them at increased risk of developing debilitating eye diseases such as cataracts or macular degeneration as adults. Try to keep kids out of direct sunlight during the middle of the day. Make sure they wear sunglasses and hats whenever they are in the sun. Sunlight is strongest between 10 a.m. and 3 p.m., at higher altitudes and when reflected off water, ice or snow. Don’t be fooled by the clouds. The sun’s rays can pass through clouds and damage the eyes any time of the year, not just during summer. If you wear UV-blocking contact lenses, you still need to wear sunglasses. The sun isn’t the only summertime culprit for eye damage. Chlorine, designed to protect you from exposure to germs, has the potential to hurt your eyes. In particular, chlorine can damage the integrity of the corneal epithelium, which protects your cornea from irritants and pathogens. This can lead to an increased likelihood of corneal abrasion or other eye injuries. The simplest solution for protection is to wear goggles. This also applies to swimming in the ocean or other natural bodies of water, as they contain other contaminants that may hurt your eyes. Dr. Peter Liggett of Hilton Head Macula & Retina is a leader in the evaluation and treatment of macular and retinal diseases. Liggett has been a clinical professor of ophthalmology at Yale School of Medicine and Weill Cornell College of Medicine. He founded New England Retina Associates, which had six retina specialists and more than 10,000 patient visits per year. He has written more than 75 articles in peer-reviewed journals and edited four major textbooks on diseases of the macula and retina. He is an examiner for the American Board of Ophthalmology, which certifies doctors to practice in ophthalmology. For more information, call (843) 422-9987 or visit hhmr.org.